One of the things I love the most about teaching is being able to use books to introduce young people to some of my own heroes. As a 6th grade teacher, I loved introducing my students to Ernest Shackleton. Last week, I pulled out two old favorite books to share with my 2nd graders: Helen Keller, by Margaret Davidson, and Louis Braille, also by Davidson. My 2nd graders listened breathlessly to Helen Keller’s story, and then asked a million questions. After hearing the story of Louis Braille, they debated with each other about who was more important — Helen Keller or Louis Braille. Both books are perfect for this age group, and I was very pleased to overhear a conversation between some of my students on their way to recess yesterday. It went like this: “You guys run and ask Helen if she wants to play Helen Keller with us, since her name is Helen. I get to be Annie Sullivan, though.” On the other hand, when I called one of my boys up to my desk and asked him why he had covered his ears when I was giving instructions on an assignment, his answer was “Well, I was trying to see what it would be like to be like Helen Keller.” I suggested he try it out at recess instead of during math. But I’m pleased that they are all so taken by the stories! This entry was posted in Children's books, Non-fiction, Teaching on January 16, 2008 by Robin. I had a very bad eye injury as a child and the doctors told my parents I might go blind at some point. I became obsessed with these two inspirational people and re-read their biographies over and over. Also tried to learn the braille on the back of the books since even then, I couldn’t imagine a like without books. I love, love this posting, Robin. I so enjoy reading about your classroom kids. Tara, that must have been a terrifying ordeal for you and your parents! Every day of sight since that time must feel like a gift, and your reading must be all that more precious to you. I can’t imagine a life without books, either. Thanks, Nan. It’s such a joy to be teaching this year, and I have such a fun group of kids. SO COOL! I’m a teacher too, and I know what you mean! It’s so cool to see the kids get excited about learning (even when they don’t know that’s what they are excited about!). Way to go, teach! When I was young, I had a bio of Helen Keller and I did the same thing as your student (at home) – covering my ears, closing my eyes and trying to imagine what it would be like to lack those senses. I ended up feeling simply awestruck. What an amazing woman she was — and what a terrific lesson for your students. Hi Renee, those moments are the joyful ones, aren’t they. Hi Bookfool. 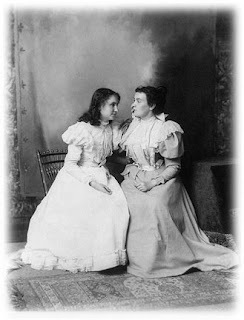 Although it’s true for all ages, Helen Keller’s story is such a powerful one for children. It’s the first time they’ve really thought about what it means to be able to see and hear and learn. I love introducing her to young people.